MODULAR HOME BUILDER: This Tiny House Looks Great But is it Functional? This Tiny House Looks Great But is it Functional? Tiny homes, homes usually under 400 square feet and built to RV standards have been popping up all over the US the last few years. Small architecture firms have seen the trend and are trying to make tiny homes more accessible for those who want to live simply. One such firm is F9 Productions in Colorado. 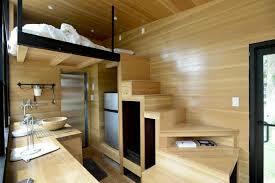 They have built a tiny house that is 195 square feet, 8 feet wide, 18 feet long and 13 feet high. 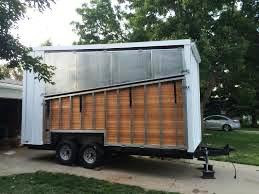 Sitting on a trailer, it features a fold-up wood porch, a fold-down awning and a full wall of windows. Inside it's clearly a model — sparse decor, lack of paint and the bathroom is incomplete. But it's easy to see what it could become with the right owners. The cost of one, from start to finish, is about $95,000. Very few, if any, other tiny homes feature a fold-up porch and a fold-down awning. In addition this house has solar panels to add extra power and the ability to collect rain water. You have to ask yourself what a tiny house built in a modular factory to IRC codes would look like and what the cost would be. I would bet it would be a lot less than $95,000 retail. 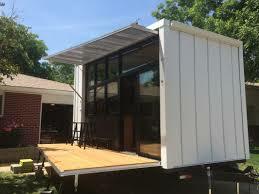 Not many tiny houses, if any, are built to the tough IRC codes that modular homes have to meet but the benefits to the homeowner would be phenomenal. There is even a possibility that it could be Energy Star certified. I have been watching this tiny house thing go from a curiosity to fad to where it is now…the seeds of a whole new industry. The people looking into owning a tiny house are just like you and I, not the free spirits of yesteryear. If you own or work for a modular home factory that has actually built one, let me know as I would love to write an article about it.